Marian Nabil Habib is an Egyptian teenager, living in Cairo. 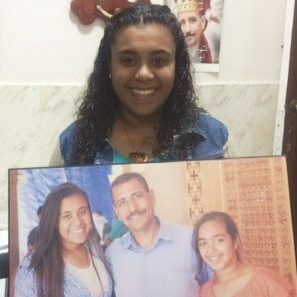 In December 2016 Marian and her family were at St. Peter and St. Paul’s Coptic Church in Cairo when a suicide bomber attacked the church. 29 people were killed in the attack, including Marian’s father. She told ACN how her father lay in her arms as he died. Daesh (ISIS) claimed responsibility for the brutal attack. Marian was only 14 when her father was murdered.